You may note that a large percentage of the Childs memory pages are written by Thalia, as to date , no other members of the Devon based family have wished to participate in this section or send in contributions. Therefore most of the articles are only one person's view. Other branches of the Childs family appear on sub sections with their contributions. Mother's attitude was - if people were nasty kill them with kindness ... our generation, being pre NHS babies, pre nuclear children - pre rye grass adults and pre GM grandmothers. Some how it sums up what we've lost, the site and why we are doing it!
" If my two brothers and two sisters sat down and wrote their version of events the reader would have five markedly different accounts. We all saw things differently and viewed the same things differently. We reacted differently and were treated differently"
Lilian first met Maurice whilst she was working in the thatched kiosk selling ices and drinks near Torre Abbey in Torquay. Maurice and his brother Dudley used to play tennis on the red clay courts. Maurice told Dudley that he had met the girls for them and later Dudley started courting Lilian's older sister Thora. Later Maurice met Lilian again when he applied for a job as a drummer in the Bird family's band. He carried his drum kit up the 200 steps to Newholm and much to his surprise they met again! 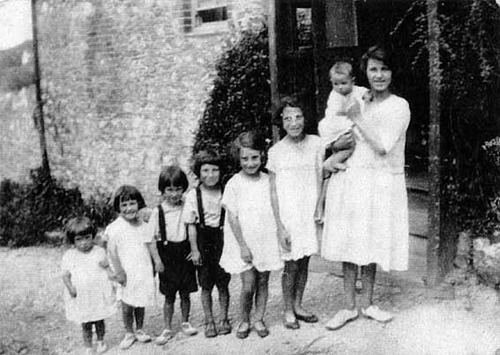 The two Childs brothers married the two Bird sisters. Lilian appeared in a beauty contest in Torquay and there is a painting of a Pageant including many of the Birds in Torre Abbey Art Gallery. If anyone has any details please let us know. Do you remember the Guardian clip about the Mass Trespass on Kinderscout Derbyshire? ** That's where Dads Attitude to "- Private - Keep Out - Trespassers will be prosecuted" Notices Came from. The notices were like a red rag to a bull to him! Has anyone still got that Article? I remember his arguments with fishing toffs and land owners about swimming and walking in the countryside, he made the case for public access very well, ignored them and did not leave. In the little Ideen during the war I forgot who told me about the discussions between GMB and POP Childs I think they had much in common but still much to argue about. I remember Dad telling me about the Aircraft industry and The Bosses deliberately making the wrong parts to sell off as scrap after the war, and him arguing with them about this and eventually being taken to court and prosecuted as a communist trouble maker. They made fortunes after the war. He had the luxury of his business to go back to so could take risks. He told us that Gerald used to rip him off a bit when he left the business in his hands But he did not mind! We used to get Black market petrol at Elys Garage to go on the moors. Do you remember the flowers in the car ashtrays? That was way out! Almost hippy, certainly eccentric. I really like and admire Dudley but he being City Treasurer was much more proper than DAD. In the aircraft industry also they were not putting the Aluminium parts in the salt bath part of the process and endangering the lives of "our boys" this too got him across the bosses. I wish I could remember the name of the boss! Dad also used to be well up on the corruption in Torquay as all the 'nobs' used to plan their scams in his changing rooms whist being measured up for posh suits. He found this amusing as they assumed he was one of them a Tory and as corrupt as them but he told me he always voted labour and loved fooling them, he never joined all those Lions Toc H etc, he always told me he wanted to spend all his time with his family. So sad how he and mum ended up. Dad was quite a rebel as was GMB, also a strong humanist only informally. Of course GMB was a theosophist. Do you remember the different smells in the houses of the RC family on one side and the Jewish family on the other. I always felt a sense of free thought in our Clean Religion free home. At Ideen 81... I of course left home in 1958, your years there were different, possibly Mum and Dad less happy much more to remember; love to hear your memories too and the others if they are interested. We Probably all have different tales, which will make up the whole. part of Cuba and set up an idealistic Vegetarian Community .. This must have been in the 1940s / 1950s.. He pooh poohed joining this scheme but to me he seemed a bit tempted?. I think he found being a shop keeper left him a little unfulfilled.. He told us when he was in the hospice he resented his father putting him in the shop!! But It certainly gave us a comfy Childhood. He told me all their Cuban plans came to an abrupt end with the Castro Revolution and The island became a place for the Cuban Youth Movement!!! Reading Southey's Life Story reminded me of this . As young Thora looked after all her 8 siblings so I had the same task. lane and rushing home to report this adventure to GMB and Mother. barren shallow bit of water. It was a treat on warm summer evenings when we all got dressed up and at Dusk went for a walk to see the Lights especially along rock walk. bit to drink jumped naked into the inner harbour.They were prosecuted and mother was very upset at their treatment in the courts and their punishment. Breakfast was two slices of bread and dripping and tea. Lunch alternated between soup (with pastry or suet pudding) and meat with vegetables. Tea was two slices of bread and margarine with tea or cocoa - except after a rare trip to Petitor Beach where winkles were collected and boiled for a feast or a twice yearly visit to Buckfast Abbey where the monks would serve up tea with scones and jam. The annual egg was served at Easter, dipped in cochineal. Christmas meant making paper chains, a tree lovingly dressed with candles and a small present from Father Christmas. Lord Churston owned the row of cottages in Mansands that the family had rented since the 1930's. During the interwar years Churston station was very busy with passengers getting off to travel to seaside towns such as Brixham. By the 1950's there were two large Pontins Holiday camps on the coast. But by the late 1950's road transport started to take over. In May 1963 the Brixham branch line closed completely and in 1965 Churtston's goods facilities closed, the branch line siding was closed in 1968. Ultimately the daisy will prevail. Soon I'll be carried to that other place. At four with my dancing school I went on the stage at the Pavilion and was sick in the wings. All our family went to the pantomime every year at the Pavilion. 1953-6 In school we did G.B.Shaw's St Joan and Shakespeare's Julius Caesar.I was involved in making the props in the art stock room. Too shy to take part in the plays. The play - The Late Christopher Bean had a strong influence on me .It was about an artist ignored in his life time but later people search for his paintings including one used to repair a hen house to sell for lots of money. We also went to the summer shows at the Babbacombe Theatre .I remember the very young ginger haired Bruce Forsyth and his jokes about how clean Torquay was as all the Seagulls flew upside down!!!! It certainly made me feel we were a close family all those shared outings. I met Breon 'O Casey and we went to London to see his fathers plays and went out with the cast after drinking whiskey in jam jars in the dressing room under a naked light bulb..
Years Later 1999 I saw a Sean O'Casey play in Malta an interesting experience seeing a play about Catholic Ireland performed in catholic Malta. A harder Macho culture which put a special spin on the experience. As a student in London in 1959 I went to all the theatres ...a few shillings in the gods. Jo Orton's Loot was on at the same time as our exhibition in Hull Arts Centre. In the 1970s we went to Powys Theatre in the community..I especially remember seeing Davids Hare's Fan Shen in Machynlleth Comunity centre which they transformed into China with just a few simple props and brilliant acting...Thatcher cut their funding!!! She had a few lucid happy times... teaching Tom to drive a small black A35 round and round the lawn in front of Glangors ..she was very fond of Tom having TAKEN HIM HOME TO TORQUAY FOR A MONTH WHEN ANGUS WAS DIAGNOSED WITH DIABETES and in hospital in Taunton ..
Also with Lucy and I took her to visit two elderly spinsters who with their brother had farmed the land across the road from Glangors before it was sold for massive caravan sites. It was the wedding day of Princess Diana on TV. Their house had not been changed for 150 years just a naked electric bulb in the ceiling and a TV...... All lime washed inside and out,tinged pink with mercury in one room and green with arsenic in the other room. These two elderly women were so different, one a fervent Welsh nationalist and the other loved the royal family. One wanted to see every detail of the wedding the other wanted it switched off. Our visit kept the peace...They made us tea with a black kettle hanging over the coal fire. The table was spread with newspaper.....mother remembered newspaper on the table in her childhood. We were very loathe to take mother back to Torquay as her version of reality and dad's just had no meeting point and they were driving each other crazy . .... Dorothy 's funeral was soon after this and from Janice's account of her visit things had only got worse. At Glangors she found the smell of meat cooking difficult. she climbed out of the bedroom window twice. still very agile. Sadly their relationship just got impossible and destructive from then on..
in the sea after a gallop on the beach. My Grey pony always tried to roll in sea! We used to ride down the tracks at the side of the valley but coming home up the wet muddy valley bottom past two ruined cottages, possibly a mill in the past . Here there was a five bar gate and the first time out Vina on her bay jumped the gate I followed and got covered in mud... we gently walked to the ponies home and dried them with handfulls of straw. I usually stayed over night with Vina in her old red sandstone Devon Farmhouse with an orchard and bees hens ducks etc, Her mother had been in Service in a big house and we had Lavender bags in our beds and all sorts of luxuries she had learnt as a servant in the big house. Then on Sunday I cycled home to Torquay. I also used to go riding around the lanes between Maidencombe and Teignmouth. This was in the 1950s just after the war. In the 1970s A rich farmer bought the farm. He destroyed the woods , drained the marsh and took out all the hedges .. Lots of bad things happened in the 1970s.